Silver Spring "Safe Sanctuary Policy"
Enjoy the peace and quiet of a setting intentionally maintaining its heritage, yet located conveniently near restaurants, grocery and drug stores, and retail shopping. Come to the Retreat Center to RELAX, REFLECT, and REFRESH. 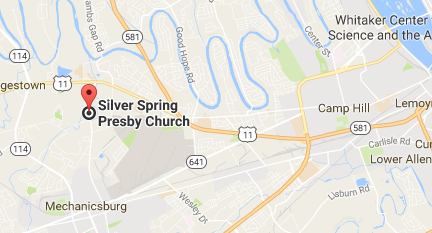 The Silver Spring Retreat Center is a unique facility located on seven beautiful, partially wooded, acres adjacent to Silver Spring Presbyterian Church (SSPC) in Mechanicsburg, Pennsylvania. The historical significance of the property becomes quite evident when consideration is given to the part SSPC and its congregants have played in the community since 1734. A portion of the retreat facility is the original stone home that served two ministers of Silver Spring Presbyterian Church in the 18th and 19th centuries - Reverend Samuel Waugh and Reverend Henry Wilson. The leadership of Rev. Waugh led to the construction in 1783 of the stone meeting house that has been continuously in use for worship. The original 18th century stone home was given additions in the mid 1800’s, the 1940’s and again in 1972. The result is a building that provides six bedrooms, a full kitchen, five bathrooms, and two large meeting spaces. All of this functionality is surrounded by a large outdoor space including a working outdoor stone fireplace. Visitors will enjoy a walk down to the stone spring - from which the church and the local municipality received their names - donated in the early 1700’s by James Silver. Stroll through the Silver Spring property to sense the voices of three centuries of ancestors who once walked these same paths. Experience a slice of history by walking through the Daughters of the American Revolution gate into the cemetery serving as a resting place for early settlers named Hoge (Hogestown), Shaull (Shaull Elementary School), Lamb (Lambs Gap), Orr (Orrs Bridge Road), and Silver (Silver Spring Township).